He was also a very wealthy man – his parents had died in his youth and he had inherited a substantial sum of money from them. However, instead of living it up on this new-found wealth, Nicholas had become a member of the clergy, and had methodically begun to give this fortune away to the deserving poor and needy. Soon, there were many stories of his charity in circulation, and miracles later began to be associated with him too. The tale of how he saved three poverty-stricken sisters from having to resort to prostitution by dropping his last three bags of gold down their chimney to land in the stockings hanging by the fire to dry is particularly famous (and is also where the practice of hanging stockings out on Christmas Eve originates). The upshot of all this was that Nicholas was canonised after his death and rapidly became the patron saint of an enormous number of groups, many of whose lives the saint had directly touched; others just that bit more random. Quite bizarrely, St Nicholas has ended up being the patron saint of sailors, children, the poor, bakers, unmarried girls (and brides), prostitutes, scholars, pawnbrokers, archers, bankers, jurors, perfumers, robbers, coopers, brewers and travellers, to name but a few! He is also the patron saint of a number of places, including Russia, Greece, Naples and Sicily. The year of his death is a matter of academic debate but it is considered certain that he died on 6th December, which has since become his feast day – and in some parts of the world, it is on 6th December that Father Christmas visits children to deliver their presents. The next set of influences on Santa take us all the way back to ancient Norse mythology. In the dark days of a Viking midwinter, it was believed that evil forces and malevolent spirits were abroad, and were out to cause mankind ill. Staying at home in the light and warmth was a much better bet – you didn’t want to meet the baleful eye of the god Odin, who, it was said, would lead a Yule-tide wild hunt through the sky, riding his flying horse Sleipnir. Some sources state that children would fill their boots with straw or food for Sleipnir and place them by the fire for the god and his magical horse to find as they flew through. Odin would then leave small gifts in the boots for the child as thanks. Odin was also seen in some sources as the entity who brings winter to the world, with the help of a demonic creature known as the Dark Helper. It was this assistant who, like Santa and his helpers, decided who had been naughty and who nice – although the Dark Helper had the power to actually punish any wrong-doers he encountered. This idea proved to have legs, as we shall see. The other Norse god associated with the Santa myth is Thor, the god of thunder, who also flew through the sky. Instead of a magical flying horse, Thor rode in an iron chariot pulled by the giant goats Tanngrisnir (Gnasher) and Tanngnjostr (Cracker). The similarities with Santa’s mode of transport are immediate and obvious (as are the influence on his reindeer as named by Clement Clarke Moore in his poem ‘Twas the Night Before Christmas). Next, we have another influence which has its roots in pre-Christian midwinter traditions. There seems to be some evidence that pagan peoples worshipped some kind of seasonal elemental spirit known as Old Man Winter, who later mutated into a personification of the season. 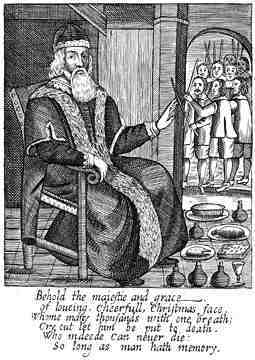 By the 16th century in Britain, this personification was known as ‘Sir Christemas’ and later he became (in combination with the figure of St Nicholas and the Norse gods) known as ‘Father Christmas’. As a result of the Medieval love of balance in all things (heaven and hell, rich and poor etc), Father Christmas was seen as being in a position where he had to figure out the good and the bad within each community and reward or punish accordingly. Of course, he needed some help with this, so the idea of the Dark Helper re-emerged from Norse myth – only this time, the church depicted him in a Christianised form as a demon enslaved by St Nicholas. Often known as ‘Black Peter’, the Medieval Dark Helper was basically an antithesis of Father Christmas and thus the darker side of a character we only associate with goodness and happiness today. 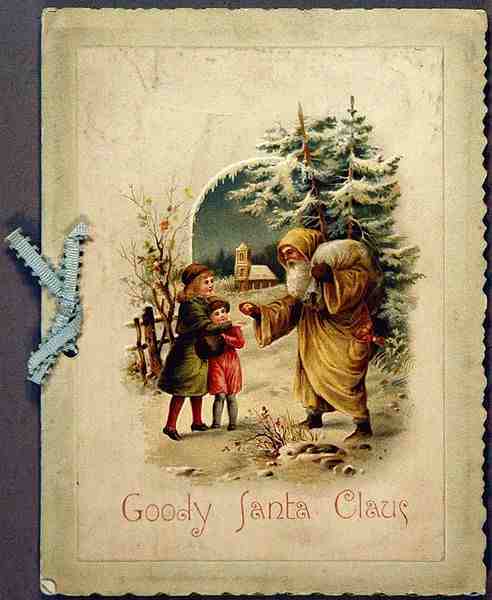 But Father Christmas was a different character in other ways during the late Medieval and Early Modern period. Rather than the gift-giver of today, this Father Christmas was the leader and overseer of Christmas celebrations in the community. And he was depicted in a myriad of different ways – tall, short, fat, thin, appearing as an elf or troll, in pagan forms as a druid or the Green Man, as a drunken man pulled in his sleigh by turkeys (! ), and as the jolly ‘Lord Christmas’ (much of which reminds me of the Ghost of Christmas Present in Charles Dickens’s A Christmas Carol). By the 19th century, all these influences were coming together to create the Santa Claus we know today. He is really an American invention, via Holland. The Dutch character Sinterklaas, another variation on St Nicholas, had crossed the Atlantic with Dutch settlers by the early 19th century and was rapidly merged with the British Father Christmas, eventually emerging as Santa Claus. A lot of the imagery now associated with Santa was introduced into Anglo-American culture by the still-popular Christmas poem ‘Twas the Night Before Christmas, which was written by the Episcopalian minister Clement Clarke Moore for his own children and published in the early 1820’s. Originally posted at my old blog in December 2008, as part of the Advent Calendar series. Reproduced here with a few minor tweaks and edits.